We watched the video repair and the part went on as slick as can be and bingo like magic the tub was filling very, very fast with warm, hot, cold water depending on our setting!! Oh my goodness! It was so easy and saved us from buying a new washer and it cost $15!!!! I am so excited!!! I get the was done in a tenth of the time!! Thanks for your parts and videos!! 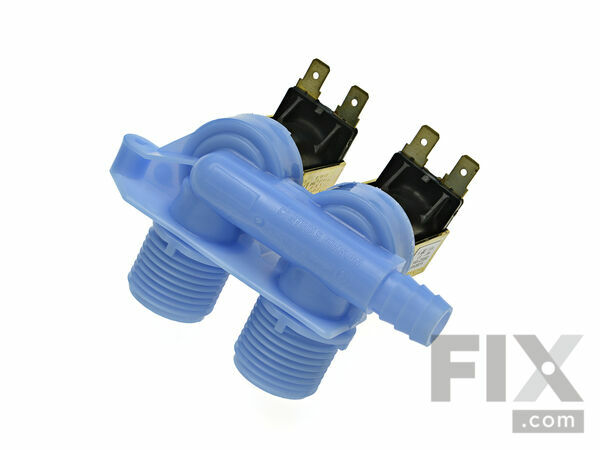 Shut off both Hot and Cold water valves. Unplugged power cord. Removed screws from control panel. Rotated control panel back and disconnected wire plug from cabinet. Removed two spring clips from top of cabinet. Tilted cabinet back and removed it from the washer frame. Removed water hoses from the rear of washer. 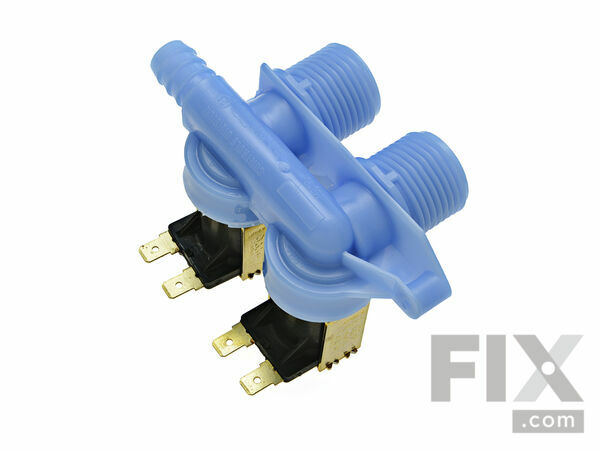 Unplugged electric plugs from water inlet valve. Removed water line from bottom of the water inlet valve. Used nut driver to remove water valve. Attached water line and clamp to new valve assembly. Mounted new valve on washer using supplied mounting plate. Newer washers will not need this plate. Connected electric plugs to new valve. Now just reinstall the cabinet / clips / electric cable. Screw the control panel back in place and hook up the hoses. It's not too difficult of a project and you will find an installation video on YouTube. 1.Hot water would not feed into washer tub. 2. Agitator stopped working. Replaced the water control solenoid and rebuilt the agitator.Rather than describing how I did the repairs I recommend watching the videos on the website. They are very informative and easily followed. The most difficult part of the repair was reinstalling the cabinet when the repairs were complete but still a cinch if you watch the videos. An extra pair of hands is helpful to guide the cabinet into place but with patience one can do it alone. Thanks for making the job simple and saving me a service call and $$$ in labor on my 23 year old washer! Washer would not stop filling. Disconnect from power, and shut off water valves leading to washer. Disconnect hoses using a bucket to catch spillage. Remove screws (hex head) that hold control panel to washer body and back, slide forward and lift off to expose spring clips that secure back to washer. Using pliers and/or a large screw driver, release the clamps freeing the top of the back from waser body. Remove screws from bottom of back while steadying the upper portion of the back. When screws are removed lift the back up and back slightly allowing the back to come to rest on floor. 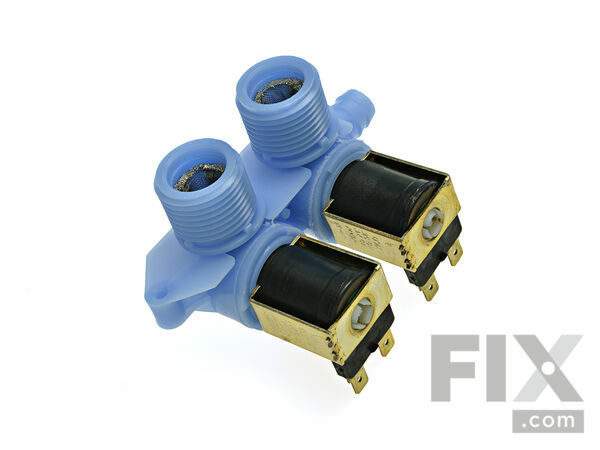 Remove plastic cover from valves, then remove electrical connectors and hose. Valve assembly will snap off of back. Install new one being careful to get it snapped back in place properly. Re-attach hose and electrical connectors, re-attach back and top control panel. Unplugged the washer, moved out the washer from the wall, disconnected the hoses from the washer. Unscrewed the two screws for the control panel and flipped in back, unplugged the switch, popped off the two spring clips that hold the back onto the rest of the machine with a screwdriver. Now I was able to tilt the entire front/side/top forward. I opted just to lean it on a chair and not to remove it completely because having removed it for a previous repair, I knew the cover was a little warped and difficult to get back on. The two screws on the inlet mounting bracket were very difficult to remove but after 25 years in place that's probably to be expected. Used WD-40 and a 5/16 nut driver to loosen. Removed the hose from the water inlet valve with a pliers. The new mounting bracket was a little different than the old one but worked ok using only one screw to mount it as the holes didn't line up. At this point everything went back together very easily. Tested both the hot and cold water. Seems to work fine with no more dripping. My husband says he's amazed at how well I've been able to fix our appliances! That's thanks to the company's helpful website. I will be back again. Water inlet valve hose threads were crossed threaded by installers. Followed directions to replaced valve. took care installing it. Cover goes on top of bottom frame base. Loud hammering noise when the basin was filling with water. Shut off the H2O. Unplugged the power. Disconnected the console and removed the cabinet. The timeliest part of the repair was disconnecting the fill hose from the bad inlet valve. Getting the cabinet back on was also a bit of a challenge (I hate sheet metal), but the job was actually quite simple. I'm just glad I correctly diagnosed the bad component on my first guess. The root cause was that I live in Austin, TX....the water is quite hard....and the hot water filter screen was clogged with sediment. I just followed u-tube of service tech. simple!